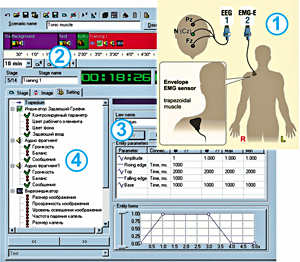 Multichannel record of various physiological parameters – EEG, EMG, skin conductance, ECG, Rheo, GSR, PPG, respiration, temperature and some other in required combinations (depending on the used equipment). 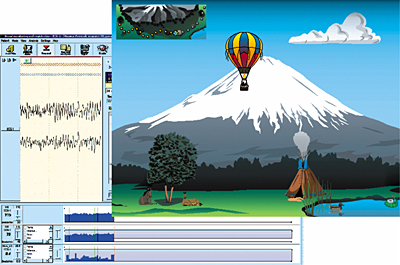 Library of biofeedback training procedures uses multimedia features of modern PCs and includes most of common types of biofeedback and neurobiofeedback by different parameters and their combinations: rhythms of EEG signals (alpha, beta, theta) and their correlation, slow cortical potential (SCP neurofeedback), heart parameters (HR, pulse transit time, systolic wave amplitude), blood circulation (central hemodynamics and cerebral circulation), autonomic nerve system (temperature, GSR), muscle (EMG and envelope EMG) and motility (range of motion, tremor, steadiness) and others. 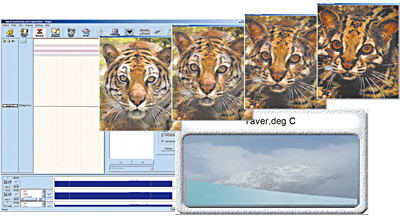 Flexible and convenient scenario editor allows modifying and adapting library procedures (or creating new ones) considering esthetic, intellectual, age and other preferences, which allows a doctor to realize various trainings for professional advancement and creative approach to biocontrol use with BFB. 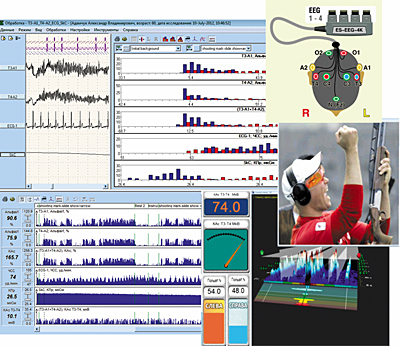 Stress-testing of body functional systems with use of various combinations of audio-visual and somatosensory stimuli and with analysis of various functional systems responses of the patient allows optimizing psychophysiological rehabilitation process. Stepwise control of physiological characteristics change during biofeedback training procedures and mathematical analysis of their change dynamics during the whole procedures course increase evaluation objectivity of efficiency of functional biocontrol methods used. 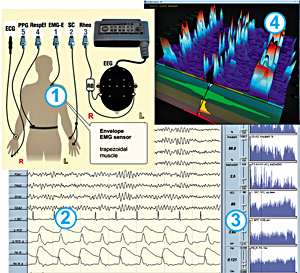 * Using electroencephalograph-recorder “Encephalan-EEGR-19/26” (main modification and “Mini” modification) as biofeedback and neurofeedback equipment, the sales package contains software for EEG-studies “Encephalan-EEGR”, which provides multiparametric signal recording, quantitative EEG analysis methods: spectral and amplitude topographic mapping (2D, 3D), coherence function, autocorrelation function, cross-spectrum function, forming a protocol, and “Cardfile” software (patients database). HR training is a basic one for mastering the skills of relaxation, self-regulation and consentration. 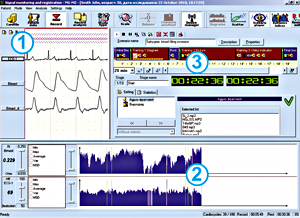 Procedures on heart rate increase allows eliminating the deficit of parasympathetic affect of ANS and increasing organism resistance to disorders of cardiovascular system work in response to psychoemotional stress. Procedures of HR variability increasing are recommended for arterial tension normalization, for physical efficiency increase and overall health improvement. HR training also increases body defenses level and neutralizes stress responses and psychoemotional overexertion, accompanied with vegetative balance disorder. Skin temperature increase training allows lowering the excessive tone of arteriola vascular walls by means of lowering the activity of sympatic section of ANS, and is applied for zonal thermoregulation improving (the increase of temperature of legs and arms peripheral zones) under the conditions of diseases manifested in reduced blood supply of these zones. This training is a basic one for Shultz auto training mastering. Procedures of blood circulation parameters regulation – tone of arteries of different caliber (by PPG systolic wave amplitude and pulse transit time) and cardio-cycles periods (by RR-interval of ECG signal) are used for autonomic nervous system functional state normalization, for correction of arterial tension indices, blood filling and etc., mainly during rehabilitation after excessive loads. Is used to treat chronical obstructive involvement of respiratory system, bronchial asthma, some circulatory disorders, vegetative-vascular dystonia syndrome, neurosal and neurosis-like syndromes. 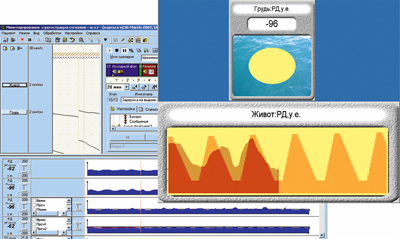 The purpose of respiratory biofeedback training is to form adequate respiratory stereotype with simultaneous switch to diaphragmal respiration type, which provides not only improvement of lungs work, but also influence on other, particularly psychic, functions and increase of functional reserve of the organism. Alpha training is oriented to improve stress resistance, to achieve profound psychological relaxation, and also to activate creativity. Alpha-theta training is used to form skills of quick and effective attention concentration. Beta- and beta-theta trainings are used to correct attention deficit hyperactivity disorder. 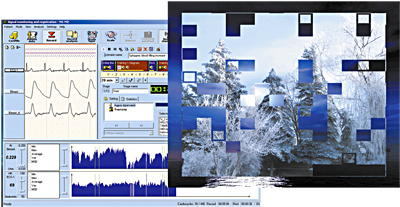 EEG-EMG-training is used to achieve the state, combined maximumal attention concentration against the background of profound muscular relaxation. Is indicated to decrease general and psychoemotional stress by means of decreasing excessive muscle activity (muscle relaxation skill), to form stereotype of optimal correlation of various muscle groups (to improve voluntary control of movement activity), to correct movement disorders of central and peripheral character of various geneses by means of decreasing spasticity and hyperkinetic activity. During stress-testing different stress stimuli can be applied: audio, visual, somatosensory. The training detects specific organism responses to various irritants for identification of the most labile parameters and their most effective use in BFB-training. 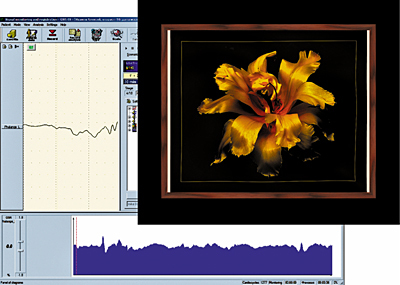 The picture shows trends, which demonstrate pronounced change in some values (mainly the ones reflecting the tone of cardio-vascular system resistive vessels) in response to a stress stimulus. 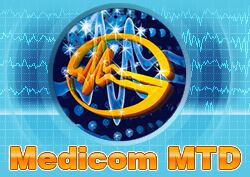 Used for skills training - relaxation and EEG structure normalisation, cortex and corticosubcortical optimum relationship tonus recovery by means of alpha rhythm increase in the occipital area in relation to the central-frontal area. 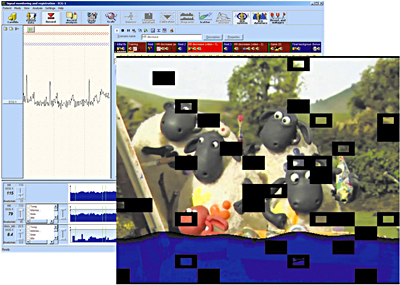 At zone differences index increase, a videoclip “waterflooding” decreases, digital indicator value increases, figure enlarges. 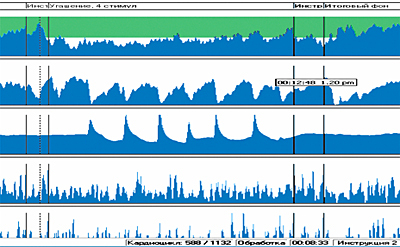 An alpha rhythm optimisation is connected with a graphic curve increase. Training to achieve a special functional state required for solving different tasks involving concentration and motor actions accuracy, for example, shooting or managing manipulators and controlled mechanisms. Training forms a skill of the arbitrary reconstruction of the brain functional asymmetry – spectral power increase of an EEG activity in a frequency range 10-14 Hz in the left temporal lobe at preparation for action and at the moment of its execution. Multiparametric control trends display increase of spectral power values within 10-14 Hz in derivation Т3-А1 (left frontal) as compared to values of Т4-А2 derivations at the background (blue) and working (red) training stages, and change of functional asymmetry in derivations Т3-А1 (left temporal lobe) at the background (blue) and working (red) training stages and change of HR and Skin conductance during training. Pathologic hand tremor control training contributes to mastering a skill of arbitrary muscle and emotional tension decrease. Hand tremor (essential tremor, secondary tremor, etc. ), bradykinesia, caused by neurological diseases, for example Parkinson disease. Used to form the skill of stress resistance in healthy people (sportsmen, students, security agencies employees, etc. ), and for therapy of patients with neuroses with symptoms of phobia and anxiety. The skill is formed by means of training on suppression of excessive autonomic activation (galvanic-skin response change) in response to stress stimulus presentation (moderate pain stimulation).